♥: Brrr in the Summer? Okay, maybe it's not for real but the image invokes a snowy day with the mittens, scarf, hat, and hot cocoa. Hopefully we won't have one of these for a while. This is my last card for Charisma Cardz as a guest designer. :-( The term was for the month of August and sadly this is the last week. Can you believe it? Things will probably be so crazy for me next month since 3 of us are adjusting to school schedules. My daughter had her high school orientation today. What? I am still in shock that she will be in 9th grade. I know in some districts high school is 10-12. Not here. She will have the wonderful 5:30 AM mornings since she has to catch the bus at 6:30 AM. Ughhh! That's torture for me too! I have to get her up and some mornings it's a real battle. Good times. :-) We are going to simulate a couple of days next week to prepare because I envision this is going to be a rough transition. I took her to the program at school today and I was as nervous as she was. I had flash backs to those first days in high school. I was literally scared. Except I don't recall an orientation to walk us through the building and see where everything is beforehand. I think we were given a map of the three levels and our schedule. Thankfully hers is only two, but they do enforce a one way hall on the bottom level because there are so many students. I guess it will prepare her for driving. Eeekkkk! No no no! Let's not explore that path. As mentioned, this card was made with the Charisma Cardz Challenge of Hot Hot Hot! in mind. This week our sponsor is Pink Cat Studio. They sell super cute rubber and digital stamps. They have a free digital image here and a super tutorial on how to print if you need assistance. Stampin' for the Weekend:#45 "Anything Goes"
Thank you so very much for stopping by! I appreciate your visits! He really IS a cutie! The plaid field and stripey string and button perfectly frame him. Lovely card and thanks for sharing. Good luck to your new High School student! Your cards are all so so so beautiful! 9th grade high schooler, wow, what a milestone!! Amy - gave you a blog award - come check out my post from today sunday the 29th for details! Adorable! 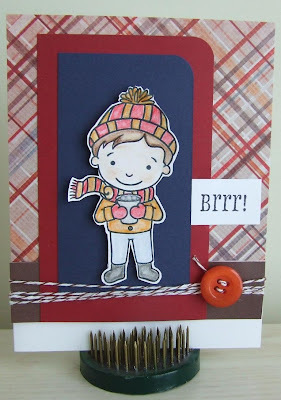 I love this cute image and the plaid paper. What a cutie! Great job coloring too. I'm sure your daughter will get along fine at school - it's usually the moms who have the most trouble adjusting. :) Have a great day and thanks for playing along at Just Scraps!